With Hyperikon’s 4ft plug-and-play tubes, fluorescent replacement has never been easier. Retrofit is now instant fit! These clear glass LED tube lights are ballast compatible, working seamlessly with more than 200 different nonmagnetic electronic ballasts for an instant, direct fit conversion, saving you 42% on lighting costs. For even greater cost savings, these tubes can also be installed as single-end powered tubes by removing the ballast for up to 60% in savings. 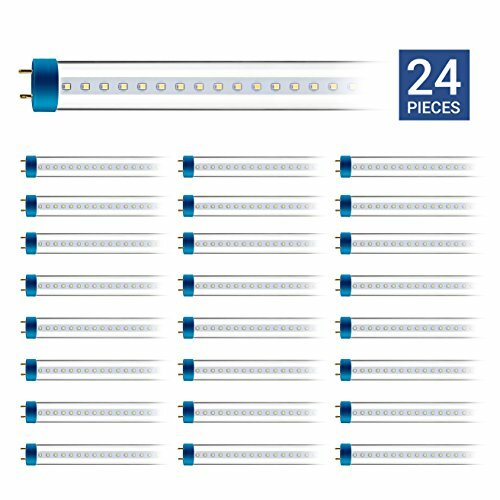 Hybrid LED tubes work with or without the existing ballast, giving you the choice in installation and the flexibility to easily rewire the tubes when the ballast reaches the end of its life. NOTE: Due to a manufacturing misprint, the packaging and labels for these hybrid tubes may read “dual-end powered.” Please note that if you choose to do a ballast bypass installation, it must be rewired for single-ended power. ✔ FLEXIBLE HYBRID INSTALL - Hyperikon LED hybrid tube lights are designed for the quickest and easiest plug-and-play, instant fit installations and are compatible with existing, nonmagnetic electronic ballasts. These tubes can also be installed as single-end powered ballast bypass tubes, providing flexibility in your installation and a simple fix when ballasts wear out. ✔ EXCEPTIONAL DURABILITY - Hyperikon LED clear glass tubes are built with patented technology to last for 30,000+ hours, eliminating the need to frequently replace your tube lights. ✔ BRIGHT, HIGH OUTPUT LED - Illuminate your space with 2000 lumens! With super bright, high output LED tube shop lights in your garage, kitchen, or workspace, you will see things in a new light. ✔ REBATE ELIGIBLE - Hyperikon LED hybrid glass tubes are Type A+Type B and DLC-qualified, making them eligible for many utility, local, state, and federal LED retrofit rebates! Save money, save energy, and be rewarded in your energy efficient choice.